There are only a few days left to February. It's almost March. Which means it's almost spring. Less than a month! So, it's time to start saying goodbye to your puffer and wool coats and to start moving your jackets to the front of your wardrobe. Because it's just about time for jackets. Jacket season, I'm feeling you. And an always-popular jacket choice? The biker jacket. Or the motorcycle jacket. Same thing. Different names. 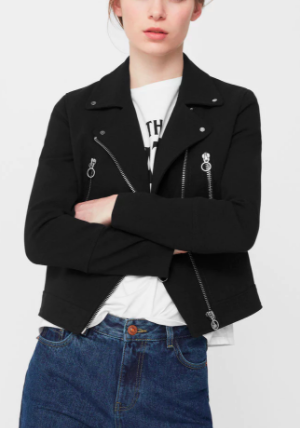 Biker jackets present that bad-girl vibe that always looks cool. But you can opt for a softer biker jacket look by choosing a light-colored, suede motorcycle jacket (sky blue, lavender, baby pink - YAS). 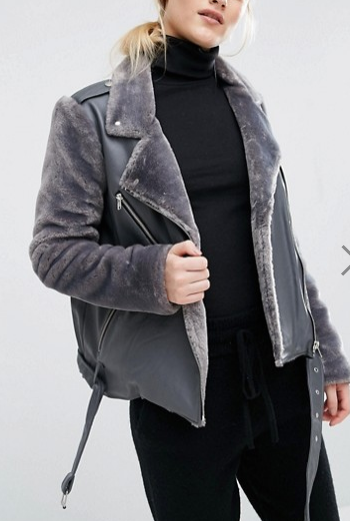 Or you can go full-on biker chick and don an oversized, leather motorcycle jacket. That works too. Above you'll find 40 biker jackets pictured in ascending price order. In all colors and materials and shapes. Take your pick.